The Apache 160 has been a part of our long term fleet since May 2018, and it's been with with us for over seven months. One thing that we’ve always loved about the RTR 160 4v is its super refined motor that has got enough punch to keep you grinning from ear to ear during daily commutes. However, in the past, while riding it in and around the closed confines of the city, I thought the suspension setup was too soft and the bike never felt as sharp as its predecessor. However, during our annual track test last month, I rode the motorcycle at the racetrack and I’ve to say I was pleasantly surprised by its handling and composure around corners. 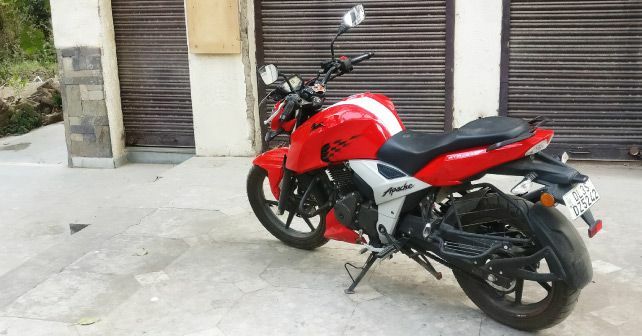 The RTR 160 4v inspires so much confidence that it turned out to be faster than the Hero Xtreme 200R! What’s most impressive about the bike is that it straddles a beautiful balance between performance and every day usability. So, is there something that I don’t like about the RTR 160 4v? Well, the brakes could have been better as they aren’t as sharp as I’d want them to be. On a few occasions, I end up bumping into other commuters because I can't get the motorcycle stopped in time. Apart from this, we recently faced a mechanical issue with the bike. Due to a bad seal, there was some severe oil leakage from the oil pan. However, TVS technicians fixed the issue within a few hours after we reported it. It’s been a month since that happened and the motorcycle is now running flawlessly again.